We are working on website to have a unique login section for each client. Each client will login and fill a form containing his personal info, contact info and info relating specifically to our service. In other words, we will collect data for each client and we want the info to be stored on his login section after submitting the form, not to have the form reseted. So if the client wants to change his contract address, to be able to see his previous submission and make edits accordingly. We dont have visuals of our website at the moment, as it is work in progress. Thanks. If you will just use the form to collect some basic information to your users, then that is possible as long as it doesn't act as a log in page. Now regarding your concern. There are a couple of ways to do this. The last part of the link is the submission ID. However, the problem on this is the submission ID, we cannot embed ALL the edit links like that, so we need to find a way to store and load the submission ID in your own database. 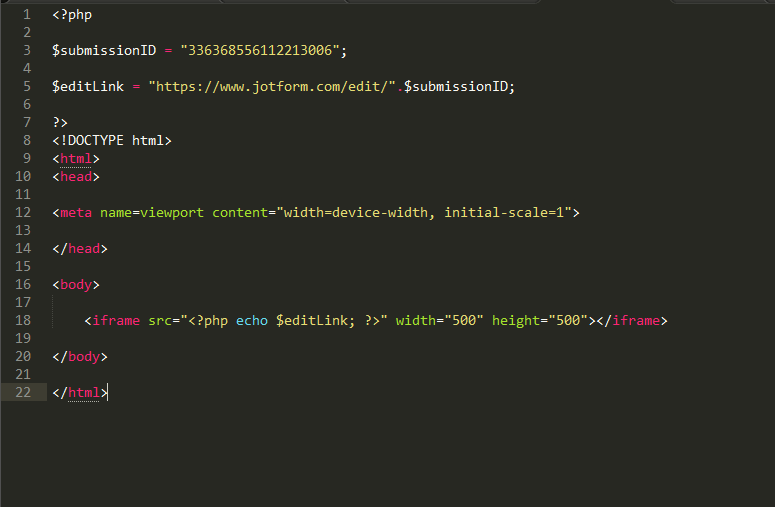 I'm basically getting the submission ID in our database, assign it as a PHP variable and pass it in the iframe src attribute with the edit link of JotForm. Your user now can update his/her submission. I hope those suggestion will help.